I summarize previous discussion of understanding craters within the recent creation paradigm. I further develop an earlier suggestion of mine, that most solar system craters date from the formation of astronomical bodies on the fourth day of the Creation Week. This proposal is consistent with the “very good” of Genesis 1:31 and the rest of the Creation account. Calling this proposal the Day Four cratering hypothesis, I interpret the overall appearance of the surface of solar system bodies. In recent years there has been increasing discussion of craters within the creation paradigm. The moon became the first known cratered surface when Galileo examined it with a telescope four centuries ago. The next cratered surface discovered was Mars when Mariner 4 flew by the planet in 1965 and returned photographs of about 1% of the Martian surface. Those photographs showed a heavily cratered world similar to the moon, which immediately revolutionized the way that astronomers considered Mars. Subsequent missions to Mars revealed that, while the Martian surface has regions of great crater density, other regions are far less cratered. Thus, Mars is a complicated world with much geology. The lesson from Mars is that we ought not to reach hasty conclusions based upon only partial reconnaissance of a body’s surface. Later on, missions to the other two terrestrial planets, Mercury and Venus, revealed that they too had craters on their surfaces. The two small satellites of Mars also have many craters on their surfaces. The Jovian planets do not have solid surfaces,1 so they cannot have craters, but missions to the outer planets showed that most of their satellites have craters on their surfaces, and some are heavily cratered. We also have photographs of the surfaces of several asteroids, and they have many craters as well. In short, craters appear to be common features on nearly all solid-surface bodies in the solar system. The two exceptions are Io, the innermost of the four Galilean satellites of Jupiter, and the earth.2 Technically, the earth has a few craters, such as Arizona Meteor Crater, and there are numerous astroblemes, or fossil craters, evident on the earth (Spencer 1998, 1999). However, the extant craters on the earth’s surface are very modest in size, and astroblemes are not obvious surface features. If we knew the earth’s surface as well as we know the surfaces of other bodies in the solar system, we would conclude that the earth had no craters. For a long time astronomers and planetary scientists debated the origin of craters. The two primary theories were impact and volcanic. The volcanic theory was the dominant theory of lunar craters during the nineteenth century and well into the twentieth century. Today we think that most craters in the solar system resulted from impacts, but a few of the smaller craters probably are volcanic. What are the meteoroids responsible for all these craters? Generally, we think that they were either asteroids or comets. For at least 40 years planetary scientists have interpreted crater density in terms of age. That is, if a portion of a surface is older, then it will have a higher density of craters of a given size than a portion of a surface that is younger. A younger surface would have been geologically reworked, thus wiping the surface clean of craters, and hence any craters visible today must have occurred after the reworking. Since a surface that has not been reworked will contain craters that formed earlier but also later, it ought to have higher crater density than a surface that has been reworked. Geological activity primarily is volcanic, but it also includes erosion from weather, thermal stress, slumping, and additional small impacts. There is a word of caution. Secular planetary scientists tend to assume the same time-varying cratering rate throughout the solar system. However, one could envision scenarios in which the cratering rate depends not only upon time but also depends upon location. That is, at a given time the cratering rate for the earth’s moon may have been different from other terrestrial planets, or the cratering rate for the terrestrial planets may have differed from that of the satellites of the Jovian planets. Additionally, the cratering rate may have not have been isotropic but instead have depended upon direction. Many Flood-related models propose this. Fig 1. The near side of the moon showing the lunar maria and highlands. This interpretation of age differences plays out nicely on the moon’s surface, which is divided between two types of surfaces, the maria and the highlands (see fig. 1). The word “maria” is plural for the Latin word “mare,” meaning sea. Astronomers 400 years ago named the maria, because they thought that the maria were bodies of water. The highlands lie at higher elevation than the maria (hence the name), but there are other differences. The highlands have higher albedo (reflectivity), which is attributed to composition differences (granitic for the highlands and basaltic for the maria). Basalt is denser than granite, so hydrostatic equilibrium causes the maria to float more deeply on the mantle than the highlands, explaining the altitude difference between the two types of lunar surface. The highlands are very rugged with a very high crater density. Astronomers say that the highlands are saturated with craters—on average any new crater that forms must obliterate one existing crater. However, the maria clearly are not saturated, for there is plenty of room between existing craters for new craters to form. Astronomers attribute this difference between the highlands and maria to age. The maria were overflowed by volcanic material, filling existing craters and providing a relatively smooth surface upon which new craters could form. Lunar maria are circular, or they appear to be overlapping circles. This and other considerations suggest that the volcanic overflow on the moon was not random, but rather it selectively occurred at the locations of very large craters that astronomers call impact basins. While some of the molten material could have been produced locally by heat released by the impacts (French 1998), much of the molten material probably came up from deep inside the moon. 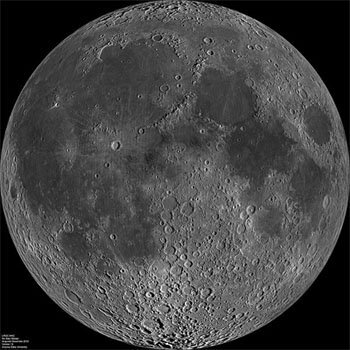 Planetary scientists think that the deep fracturing caused by the very large impacts that formed the basins acted as conduits for molten material deep inside the moon to flow to the surface. Because the impact basins are very deep depressions, most of the molten material filled the depressions of the impact basins, but in some cases molten material spilled out onto surrounding terrain. Planetary scientists long ago developed a theory of the history of the moon to explain lunar features, in conjunction with an evolutionary theory of how the solar system formed. The standard theory of solar system origin is that it formed from the collapse of a gas cloud containing a small amount of dust. Most of the material fell to the center to form the sun; the remaining material flattened into a swirling orbiting disk. Through some unknown process, matter within the disk began to coalesce into larger particles. These planetesimals eventually grew in size until some of them were large enough that their gravity attracted most of the planetesimals near their orbits to form into planets. Remaining material formed into satellites (moons) of the planets, minor planets (asteroids), and comets. Once the terrestrial planets, satellites, and minor planets had formed and cooled so that they had solid surfaces, their gravity continued to assist them in accumulating remaining planetesimals. This accumulation took the form of impacts that heavily cratered the now surfaces of planets, satellites, and minor planets. Astronomers call this episode the Early Heavy Bombardment (EHB) that continued until about 4.1 billion years ago. Between 4.1 and 3.8 billion years ago was the Late Heavy Bombardment (LHB) when very large and intense cratering occurred. After the LHB, the cratering rate greatly reduced to nearly the slow rate that we have today. The distinction between the EHB and LHB was required because of the fact that many large impact basins appear to have formed on the moon very late. This paradigm of interpreting craters on the moon has been imposed upon the rest of the solar system. There are some problems for this evolutionary paradigm. First, as Oard (2009) has pointed out, the EHB has been inferred from the evolutionary theory of the origin of the solar system. If the planets formed in the way generally thought, then of necessity there was much cleaning up of the leftover planetesimals, and this process would have left impacts on the solid surfaces of the solar system. A creationary approach might allow for a single episode of bombardment as opposed to two distinct ones. Second, the source of the large number and size of meteoroids of the LHB is unknown. Again, a creationary interpretation may allow for the source of these meteoroids. While recognizing the likelihood of impacts at any or all of these times, the two camps have primarily concentrated on only one of these four possibilities as responsible for the vast majority of craters. Brown (2008), Oard (2009, 2012, 2013), and Spencer (1994, 1998, 2008, 2013) have developed the belief that most impacts were associated with the Flood, either as an initiation of the Flood and/or accompanying the Flood. On the other hand, Faulkner (1999, 2000) and Samec (2008a, 2008b) have proposed that, similar to the EHB and LHB, most craters date from the origin of astronomical bodies on Day Four, while a significant, but less intense, cratering event accompanied the Flood. Both camps believe that impacts since the Flood have been much rarer. God made all astronomical bodies, including the moon, the planets, and satellites on Day Four. As I’ve argued in an earlier paper (Faulkner 1999), the astronomical bodies likely were fashioned on Day Four rather than created instantly and ex nihilo on that day. This conclusion stems from the consistent use of the Hebrew word asah in the Day Four account ( Genesis 1:14–19 ) rather than bara. While these two words may be interchangeable in some contexts, one ought not to assume that they are freely interchangeable in all contexts. And, contrary to common misconception, bara does not always mean ex nihilo creation. For instance, man was both made (asah, Genesis 1:26) and created (bara, Genesis 1:27). Furthermore, Genesis 2:7 reveals that God formed man from dust of the ground, which clearly indicates that man was not created ex nihilo. The forming of man from dust suggests a process, which, while brief, does not demand that it was instantaneous. In similar manner, the assembly of astronomical bodies on Day Four may have been rapid but not instantaneous. The Day Four cratering hypothesis proposes that many craters bear testament to at least the last stages of that assembly. Some recent creationists may respond that this is the same as the evolutionary history of the solar system (for instance, see Henry 2003, 2010). However, there are several differences. First, this process would have been very rapid, taking a day or less to accomplish rather than millions of years. Second, this would have been an event directed by God rather than a random process. Third, being during Creation Week, elements of miraculous rather than purely physical processes that we see operating today likely were at work. For instance, on Day Three, plants sprouted and rapidly reached maturity. On Day Five living things filled the seas and sky. Likewise, on Day Six land animals appeared in abundance, and God made man from the earth. Fourth, because the earth was already made and the land was occupied by plants, the earth did not share in this episode. Remember that I propose that most craters came from assembly on Day Four. Since the earth was already created on Day One, it did not go through assembly on Day Four. The moon’s creation on Day Four was a directed act of God, so the earth was in no danger of bombardment during the Creation Week. This is important, because if my hypothesis is correct, then the earth did not share in the vast bombardment that every other body in the solar system did, an event that most astronomers refer to as the EHB. In the evolutionary theory, the earth once was as cratered as other bodies, but those craters were removed through geological reworking. In the Day Four cratering hypothesis neither of those processes took place. A fifth difference is that in the Day Four cratering hypothesis what most astronomers call the LHB affected mostly the earth and moon, not the entire solar system. The major objection that many recent creationists may have to the Day Four cratering proposal is that this introduces craters prior to the Fall. This comes from a belief that the existence of craters at the completion of the Creation Week would violate the “very good” description of Genesis 1:31 . Many creationists believe that “very good” equates with perfection, going so far as to suggest that the second law of thermodynamics was not in effect until the Fall. Recently Anderson (2013) and Faulkner (2013) have challenged this view. I will briefly discuss some of their conclusions here. The Hebrew word for “good” and “very” are well translated into English. The good mentioned here has three possible meanings, referring to moral goodness, completion, or purpose, and all three meanings probably apply here. Sin, along with its consequences, had not yet entered into the world, so there was moral goodness in the world. However, God rested (or ceased creating) on Day Seven, so the creation was completed. Since God was pleased with what He had made, the world was very good in terms of completeness with regards to God’s intentions. And the creation filled God’s intended purpose. Moreover, six times prior Genesis 1:31 God pronounced what He has made as “good.” In each case (light, division of land and sea, plants, astronomical bodies, fish and fowl, land animals) God had finished each particular types of things that He had made, so they were complete. How does one extrapolate “very good” into perfection? Since sin was not in the world, the creation (including Adam and Eve) was perfect in the moral sense. And since God had made the world to serve His purpose, the creation was perfect in that sense. But was it perfect in some physical sense? Perhaps some creationists impose a standard of physical perfection onto the world that is not demanded by Scripture. The problem is that we frequently equivocate in such matters. We use the terms “fault” and “defect” to refer to moral imperfection. Unfortunately, we use the same words to describe what we perceive as deviations of some physical ideal. For instance, a crystal is an orderly array of atoms or molecules in the solid state. The pattern of a crystal is very simple—one can identify the locations and types of particles anywhere within the crystal based upon that pattern. However, all crystals contain defects, or deviations from the pattern. Therefore, there is no perfect crystal. With the belief that the “very good” of Genesis 1:31 is equated with physical perfection, Williams (1966) speculated that in the original Creation prior to the Fall that all crystals were “perfect.” We know that there were crystals present from the beginning. For instance, onyx, which has a crystal structure, is mentioned in Genesis 2:12 . This verse also mentions bdellium, which may refer to the resin of a tree, though it may refer to a precious stone, which would make it a crystal too. For that matter, this verse also mentions gold, which, being a metal, has a crystalline structure. Even more significantly, the original earth contained a tremendous amount of rock, and rocks have crystalline structure. Does the “very good” description of the original creation imply that none of these rock crystals contained any defects? If there were a few microscopic crystal defects, would this be a problem for a “very good” creation? I hardly think so. There would be no moral compromise. The creation as such could fulfill its purpose just as easily as it would if all crystals were “perfect” or not. The world, even with a few microscopic crystal “imperfections,” would be complete. Or consider the river described in Genesis 2:10–16 . That river was most unusual, for it split into four rivers. All rivers have channels, and the original channels of these rivers may have been excavated by God. But it isn’t necessarily true that God specially made these channels, and river channels are maintained by erosion. Many people who think that the “very good” of the original creation is to be equated with perfection also think that the second law of the thermodynamics was invoked at the Fall and that entropy is equated with decay of any and all types. That is, any decay is incompatible with perfection. Erosion as in a river channel would appear to be decay and hence would violate this concept of perfection. Insisting that entropy began at the Fall leads to further problems, such as digestion of food and seeing the sun. Digestion is an excellent example of the second law of thermodynamics, and we know from Genesis 1:29–30 that Adam, Eve, and animals ate before the Fall. In its most basic form, the second law of thermodynamics governs the direction of the flow of thermal energy, which insures that heat energy flows from hotter to cooler. The sun’s photosphere is far hotter than the earth, so radiation flows from the sun to the earth (Hill 2001). These and many other considerations strongly imply that the concept of equating the “very good” of creation with an arbitrary ideal of perfection is incorrect and goes far beyond what is required by the biblical text. Ultimately, the proponents of the notion that the original creation was “perfect” become the arbiters of perfection. They opine that craters do not fit into their concept of the originally perfect world, so craters must not have existed then. But why must this be the case? Such a conclusion is not taught in Scripture, so this belief is several steps removed by what is demanded by the Bible. Some may object that craters bear testament to judgment, and hence would violate the spirit of “very good.” But in this proposal of Day Four crater formation there was no judgment, but rather the craters were the record of the latest steps in assembly. Because other bodies in the solar system lack living things, a crater on their surfaces presented no danger to organisms. The purpose and means of the assembly of the planets had no component of judgment. That is, impacts are neutral, but they could be viewed as either destructive or constructive, depending upon the location, timing, and aftermath. The earth’s original surface had features that resulted from its fashioning, with the processes on Day Three likely being dominant. 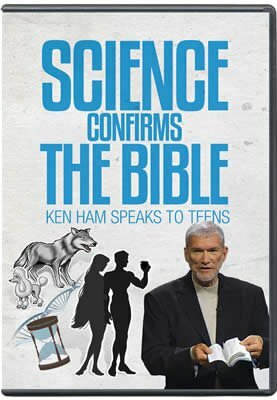 However, since God specially prepared the earth for life and man, its original surface probably was very different from the surfaces of other bodies, even as it is today. What appearance did the surfaces of the moon, planets, their satellites, and asteroids have after their completion, say on Day Five or at the end of the Creation Week? Let us explore the possibilities of the viewpoint of equating “very good” with extreme perfection. This viewpoint immediately eliminates craters, as previously discussed. We probably can eliminate all volcanic features, for volcanism normally is equated with imperfection and/or judgment. The gathering of waters and the appearance of dry land in Genesis 1:9 probably involved vertical motion of rock on the earth. There is no biblical indication that other bodies underwent such a process. Furthermore, since liquid water, while abundant on earth, is a rare commodity elsewhere, there would have been no need for vertical motion of rock to separate water and dry land as on earth. This is further underscored by the fact that the purpose of this separation, to prepare the earth for life, was not required on other bodies. These considerations would seem to eliminate all manner of vertical relief on other bodies. Once vertical relief is removed as a possibility, we are left with the conclusion that astronomical bodies were perfectly spherical. Exactly spherical bodies may appeal to some creationists’ concept of a perfect initial creation, but this is hardly required by Scripture. Furthermore, the idea of perfectly spherical astronomical bodies is not a novel concept. Aristotle thought that the sun and moon were perfect spheres. Through the work of Thomas Aquinas the Roman Catholic Church adopted this belief, which in turn caused problems for Galileo with his telescopic observations. When Galileo saw spots on the sun, his critics countered that that was impossible since the sun was perfect and could not have blemishes. When Galileo saw the rugged surface of the moon with its craters and mountains, his critics reminded him that the moon’s surface had to be perfectly smooth. Aristotle’s conclusion came from a totally different direction than modern creationists. He used a pagan worldview to reason that unlike the imperfect terrestrial world, the heavenly realm was perfect. This compelled heavenly bodies to conform to ideals of perfection, such as not having blemishes, moving in perfect manner, and having perfect shape. Since the circle is the most perfect shape, heavenly bodies must be circular (in three dimensions spherical). Perfect motion required uniform circular motion, which in turn led to the Ptolemaic model with its complex system of epicycles. While a very successful theory (it was widely believed for 15 centuries), the Ptolemaic model eventually was abandoned in the seventeenth century. Persistent belief in the Ptolemaic system held back the progress of modern science. This lesson ought not to be lost upon modern creationists. As the blind alley of Aristotelian perfection impeded the development of science, we ought not to let the blind alley of an extreme view of the perfection of the original creation retard the development of models of recent creation. The Day Four cratering hypothesis proposes that much of the lunar highlands date from the Creation Week, but that the lunar maria formed during and shortly after the Flood.3 This conclusion is reached by several considerations. First, with their low crater density, the lunar maria appear to have formed later than much of the rest of the lunar surface. Second, the volcanic overflow that formed the maria appear to have been preceded by impact basins. Impact basins are very large craters on the lunar surface, suggesting that they were the sites of the largest impacts on the moon. While there are a few impact basins on the moon that did not experience volcanic overflow (such as the Aitken Basin), these basins appear much older than the impact basins underlying the maria. Why the Aitken Basin did not precipitate volcanic overflow is not known, though some suggest that this is because the lunar crust is thicker on the far side of the moon. Third, the preponderance of lunar impact basins and maria are on the side of the moon that always faces the earth. This suggests that the impact basins associated with the maria formed very rapidly, or else the moon’s one month rotation period would have permitted more uniform impact basins. Further, the close proximity of the earth suggests that the earth was struck as well. Previously I have referred to the lunar impact basins as collateral damage, because the earth was the primary target at the time of the Flood. Fourth, worldwide the earth’s sedimentary rocks contain many astroblemes, what appear to be fossil craters. If these indeed are craters and if, as we recent creationists believe, most of the sedimentary rocks were laid down during the Flood, then the earth endured many impacts during the Flood. In contrast, the view that the solar system endured an influx of meteoroids at the time of the Flood that accounts for virtually all craters has some problems. One problem is the great amount of heat generated by the large number of impacts on the moon and some other bodies that happened very rapidly. The same could be said of the Day Four cratering proposal, but during the Creation Week one easily can appeal to special (miraculous) conditions to alleviate that problem. The current sustaining of this world ( Hebrews 1:3 ) that we recognize as physics today was established during or at the conclusion of the Creation Week. Most Flood models involve physics as we now know it, suggesting the assumption of sustaining physics at that time. So, the appeal to a miraculous cooling mechanism at the time of the Flood ought to be less palatable than miraculous cooling during the Creation Week. Another problem is that the surfaces of slowly rotating bodies, such as Venus and Mercury, do not show a greater density of craters on one side that one might expect from a brief episode of impacts. A final problem is that the very high crater density on other bodies such as the moon suggests that the rate of impacts upon the earth during the Flood would have been unacceptably high. The effects of the impacts would have dwarfed those of the water of the Flood, but there is no hint in the biblical records that this was the case. Furthermore, one must invoke extraordinary protection of the occupants of the Ark from the impacts during the Flood that goes far beyond the biblical description of God’s provision of an ark. As creationist geologist Steve Austin has pointed out, Genesis records Noah’s Ark, not Noah’s bunker.4 At the recent International Conference on Creationism Samec (2013) reviewed the surface of Mars. He proposed that Mars has undergone episodic intense volcanic eruptions. These eruptions produced large amounts of water that briefly terraformed Mars. Before evaporating and subliming from the planet, the water caused the large amount of stream erosion evident on the planet and could have resulted in an ocean that covered the depression in the northern hemisphere. The action of the water in that ocean may have removed much of the evidence of craters that once existed in that region. So far, most of the discussion of craters in a recent creation framework has concerned the earth and moon. Therefore, a survey of the surfaces of various bodies in the solar system in this light is in order. In the Day Four cratering hypothesis the EHB would account for most craters in the solar system. This would have coincided with the last stages of the moon’s formation on Day Four, so the lunar highlands date from the Creation Week. What scientists normally refer to the LHB would have happened at the time of the Flood, and would have resulted in the lunar maria. The moon was the only body that participated in both the EHB and the LHB; the earth experienced the LHB but not the EHB, and the rest of the solar system participated in the EHB but did not undergo much, if any, of the LHB. What might this approach reveal about the other terrestrial planets? Fig. 2. 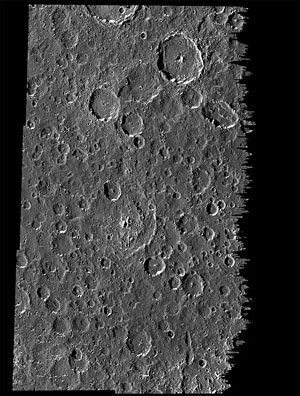 Messenger Mission mosaic of half the surface of Mercury. With its many craters, at first glance Mercury’s surface (see fig. 2) resembles that of the moon, but there are differences. One difference is that mercurial craters are shallower and have smaller ejecta blankets than lunar craters. This is attributed to the much greater gravity on Mercury. Another difference is that the surface of Mercury is not so clearly segregated into heavily cratered and volcanic terrains. For instance, there is no large albedo difference as there is between the lunar highlands and the maria. This suggests a more uniform surface composition on Mercury. Additionally, there are no large smooth regions on Mercury as on the moon (the lunar maria). 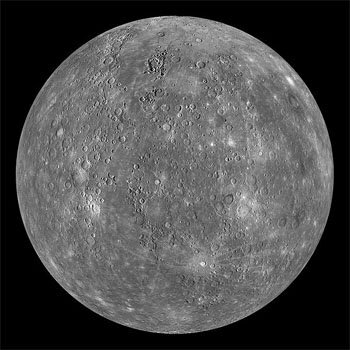 On Mercury there are spotted and scattered heavily cratered regions. Interspersed are the older intercrater plains, and there is much debate about the origin of them. Some planetary scientists think that the intercrater plains were filled with volcanic material, while others think that the intercrater plains were filled with debris from crater formation. Whatever filled the intercrater plains, they likely covered over an older, high crater density terrain underneath. Then the impacts of the heavily cratered terrain modified the intercrater plains. The relative ages of the heavily cratered terrain and intercrater plains derives from the morphology of the craters involved—sharper craters likely are younger. There are several impact basins on Mercury. The most notable, the Caloris Basin, is one of the largest impact basins in the solar system. Diametrically opposite the Caloris Basin is the Weird Terrain, a much jumbled region. Most planetary scientists think that seismic waves from the Caloris Basin impact met and constructively interfered to produce huge displacements to produce the Weird Terrain. In addition there are smooth plains that suggest volcanic overflow. All of these considerations suggest that volcanic activity was present throughout the cratering that occurred on Mercury. This contrasts with lunar volcanism that apparently was not present until after the impact basins formed. And the overflow of molten material on Mercury was much more localized than on the moon. There are a number of scarps that cross over most terrains on Mercury. The scarps give the appearance of shrinkage of this planet. This likely coincided with solidification of portions of the mantle, which happened after most other surface features of Mercury had already formed. How might we interpret Mercury in the Day Four cratering model? There is no reason why most of its surface features could not have formed on Day Four. Small scale local volcanism might have accompanied the craters in time, if not as a consequence. This would have included the Caloris Basin and Weird Terrain. The shrinkage that produced the scarps could have happened on Day Four or some time later. There is no compelling reason to think that Mercury’s surface was modified much at the time of the Flood or any other post-Creation Week event. Hill (2008) has reviewed the surface of Venus. Venus has a sparse but uniform distribution of craters. This fact, along with the sharp morphology of its craters, suggests that Venus underwent a total overturn of its surface in the recent past. The parallel to extremely rapid tectonic activity on earth that many recent creationists have proposed accompanied the Flood is striking, as if God caused rapid tectonics on Venus (sans Flood) to show us such a thing was possible on the earth. However, there are differences from the earth, such as the lack of some features that suggest that Venus does not have tectonic plates as the earth does. There are several possibilities here. First, the tectonic activity that erased any craters that Venus may have had could have occurred during the Creation Week as well. Hence, the few craters that it now has would be post-Creation Week, but none would be associated with any particular biblical event. Hill has suggested that RATE could have precipitated the upheaval on Venus, with subsequent slow random impacts. The most interesting, but also most difficult, planetary surface to interpret is that of Mars. Curiously, very few creationists have written about the Martian surface, so there is much work to do here. There is a very clear hemispherical dimorphism on Mars, with the hemispheres tilted slightly from the poles. The heavily cratered southern hemisphere generally lies several kilometers higher than the much less cratered northern hemisphere. The region with low crater density could be be the result of volcanic overflow, provided that the rock in the lava had greater density than surface rocks on the other half of Mars. The sparsely cratered lunar maria also are at lower elevation than the heavily cratered lunar highlands, so it is tempting to favorably compare this hemispherical segregation to that of the moon, but there are marked differences. While one hemisphere of the moon (the one that faces earth) has most of the maria, only about half that hemisphere is maria. The remainder is highland. While some impact basins on Mars are found in the northern hemisphere, many of them are not obvious. The most obvious impact basins, Hellas Planitia and Argyre Planitia, are in the southern hemisphere. They stand out, because they are deep depressions in an otherwise high altitude hemisphere, and they have not been modified by volcanic overflow as much as the northern hemisphere basins have. Thus it is not clear whether the hemispheric dimorphism on Mars is related to large impacts. Complicating the picture are two volcanic regions. The Tharsis region has three volcanoes, is located near the edge of the elevated southern hemisphere, and it contains the highest average elevation on Mars. Nearby is the oversized shield volcano Olympus Mons. About 90° west of the Tharsus region is the Elysium region, containing three more modest volcanoes. Though the area around the center of its three volcanoes is elevated to that typical of the higher southern hemisphere, the Elysium region is clearly in the lower lying northern hemisphere. Both volcanic regions appear to have higher elevation as the result of overflow. Commencing 30° eastward of the Tharsis region volcanoes and extending another 45° in longitude is the famous Valles Marineris. Nearly everyone agrees that Valles Marineris is a rift. Many think that it likely is related to the huge bulge in the nearby Tharsis region. Finally, the Hellas basin is nearly antipodal to the Tharsis region, suggesting a possible connection between the two. Most puzzling are the many evidences of water erosion on Mars. Nearly all types of water-caused features, such as alluvial fans, valley networks, meandering channels, and deltas are present on the Martian surface. There is evidence that lakes and possibly even oceans once existed on Mars. Some noncreationist scientists have suggested that a nearly global flood once occurred on Mars, a planet where precious little water seems to exist today. It’s as if God caused a large flood on a planet with almost no water to show mankind that such a thing is possible on earth where there is abundant water. It is very clear that liquid water cannot exist on Mars today, so it is a mystery when and how all this happened. Fig. 3. 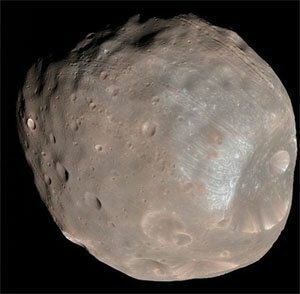 Phobos, one of the satellites of Mars. But such a great problem presents us with great opportunity, so creationists may devise many possibilities. The Day Four cratering hypothesis suggests that much of Mars was initially heavily cratered. Some of the primordial surface may survive in the heavily cratered terrain of the southern hemisphere. When did the northern hemisphere overflow with lava? One could posit that it occurred sometime after the Creation Week, but it is possible that it was late on Day Four or may have started then continued for a while afterward. The same is true of Valles Marineris. As for the liquid water, perhaps Mars originally had a much thicker atmosphere with much liquid water, but it rapidly lost both due to its relatively weak gravity. This would have caused rapid deposition and flooding but with diminishing intensity for a few centuries after the Creation Week. Was there enough time in the recent creation model for Mars to have lost a significant atmosphere? It would be most helpful if an atmospheric scientist would model this. At the recent International Conference on Creationism, Samec (2013) reviewed the surface of Mars. He proposed that Mars has undergone episodic intense volcanic eruptions. These eruptions produced large amounts of water that briefly terraformed Mars. Before evaporating and subliming from the planet, the water caused the large amount of stream erosion evident on the planet and could have resulted in an ocean that covered the depression in the northern hemisphere. Rather than volcanic overflow that erased craters in the northern hemisphere, perhaps water in that ocean may have removed much of the evidence of craters that once existed in that region. Much of Samec’s Mars desert hypothesis could be incorporated into the Day Four cratering hypothesis, with catastrophic flooding either after the Creation Week or commencing Creation Week and continuing for some time afterward. Samec prefers several episodes of wet and dry cycles with some evidence of alternating deposits on the Martian surface. However, just as with earth’s sedimentary deposits, this evidence could be interpreted in terms of bursts of activity within a single episode. Fig. 4. 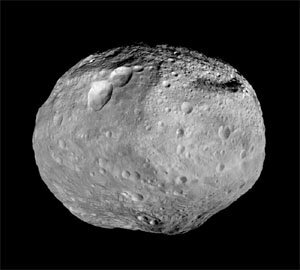 The minor planet 4 Vesta. We must be careful in how we interpret some of the smaller bodies in the solar system. While we have photographic reconnaissance of most of the surfaces of some bodies, we have mapped less than half the surfaces of other bodies. For instance, the Galileo probe to Jupiter has allowed us to photograph almost the entire surfaces of some of the Galilean satellites. However, other bodies, such as the satellites of Uranus and Neptune, were visited by a single fly-by mission (the Voyager 2), so less than half their surfaces have been surveyed. We tend to extrapolate the surface that we know to the portions that we don’t know. Future missions may map the unknown sides, and such future reconnaissance might radically change our understanding of these bodies. With this caveat, I will discuss the surfaces of some of the smaller bodies of the solar system in the context of the Day Four cratering hypothesis. Fig. 5. A portion of the surface of Callisto, one of the Galilean satellites of Jupiter. The non-planetary bodies of the solar system show varying amounts of craters. The smaller bodies, such as asteroids and the two satellites of Mars, are heavily cratered and show little evidence of reworking (see figs. 3 and 4). The small satellites of the Jovian planets have similar appearance. This suggests that they were assembled according to the Day Four cratering hypothesis, but that they have undergone relatively little change since. Some of the larger satellites show some history since the Creation Week. Consider the four Galilean satellites of Jupiter. Io has no craters, suggesting that it is volcanically active, as evidenced by Voyager and Galileo probe photographs of erupting volcanoes on Io’s surface. Spencer (2003) has discussed Io’s volcanism in a recent creation viewpoint. Io is the most volcanically active body in the solar system, and it probably was made so on Day Four, with some diminishment since. Europa has a few craters, indicating that its surface has been reworked extensively since Day Four. 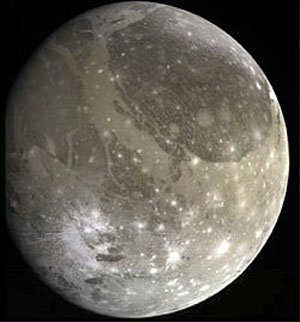 Ganymede and Callisto are heavily cratered, suggesting relatively little geological activity since their creation. Because their surfaces contain so much ice, many of the oldest appearing craters on Ganymede and Callisto have lost much vertical relief. Planetary scientists call these craters palimpsests. Palimpsests are common on icy satellites of the Jovian planets. Callisto is saturated with craters, making it the most heavily cratered large satellite (see fig. 5). However, Ganymede has less crater density than Callisto, suggesting that it has undergone modest reworking. About one third of Ganymede’s surface is darker and has crater saturation. The other two thirds of the surface is lighter, has less crater density, and is crossed by Ganymede’s famous grooved terrain (see fig. 6). Though not completely understood, the grooves and ridges are thought to be tectonic. Because all regions of Ganymede’s surface have such high crater density, the Day Four cratering hypothesis would interpret the geology of Ganymede’s surface almost entirely in terms of Day Four events with some modification on portions since. Fig. 6. Galileo image of Ganymede, one of the Galilean satellites of Jupiter, showing craters and grooved terrain. Titan is Saturn’s largest satellite and is the second largest satellite in the solar system. It is the only satellite with an extensive atmosphere. Titan’s atmosphere makes it difficult for us to map its surface in the visible part of the spectrum, but the Cassini mission carried infrared instruments, as well as a radar altimeter and synthetic aperture radar apparatus. This equipment permitted mapping a portion of Titan’s surface in some detail. Those images reveal a surface that has few craters and hence is interpreted as being relatively young. Some of the craters have sharp morphology, suggesting very recent origin, but others appear to have been modified by volcanism (see fig. 7). Much of the uncratered surface shows evidence of volcanic activity, but I ought to clarify what type of volcanism likely exists on Titan and other satellites so far from the sun. Most of the satellites of Saturn, Uranus, and Neptune have densities of less than 2.0 gm/cc. This is consistent with a composition that is less than 50% rock. Most of the mass of these objects is made of ice, primarily water ice, but with ammonia, methane and other volatiles also present. Water and these other volatiles probably are the molten material involved. Planetary scientists have coined the term cryovolcanism to refer to this sort of volcanic activity, which obviously occurs at a much lower temperature than when rock is involved. Since Titan likely is still active, much of its geology and surface features probably post-dates the Creation Week. Fig. 7. 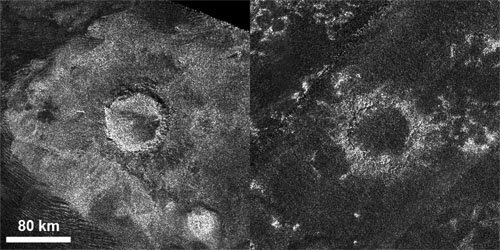 Cassini radar images of two craters from the surface of Titan, a satellite of Saturn. The crater on the left has sharper morphology, suggesting younger age. Rhea and Dione, the second and fourth largest satellites of Saturn, are very similar (see figs. 8 and 9). As with every satellite that we have examined closely, they have synchronous rotation. That is, they rotate and revolve with the same period. This means that they keep one face toward the planet at all times, but they also keep one face forward in their orbits (the leading side) and one face trailing (the trailing side). The leading sides of Rhea and Dione are very different from their trailing sides. The leading side of Rhea is bright and contains many craters. The trailing side is darker and contains markedly fewer craters, but the trailing side also is crossed by brighter swaths that appear to be tectonically formed ice cliffs. This suggests that little geological reworking has occurred on the leading side, but that much more has taken place on the trailing side. Alternately, more impacts occurred on the leading side as it orbited Saturn. The latter explanation is supported by most planetary scientists. 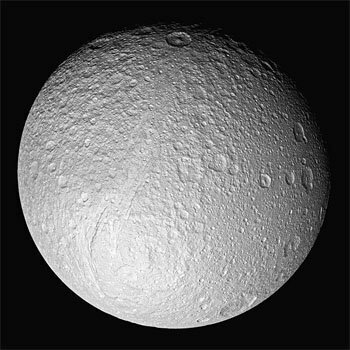 However, the appearance is reversed on Dione, with the leading side having fewer craters and the trailing side having more. The standard explanation is that Dione originally had its more heavily cratered side leading, but that a large impact spun it around after most craters had formed. The leading side of either satellite is brighter than the trailing side. This amounts to special pleading. It’s not clear how this surface could be interpreted in terms of the Day Four cratering hypothesis. Fig. 8. Cassini image of Rhea, a satellite of Saturn. Fig. 9. Cassini image of Dione, a satellite of Saturn. Iapetus, Saturn’s third largest satellite is strange (see fig. 10). 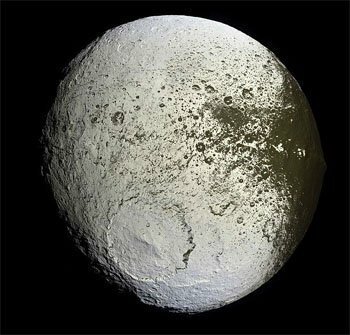 It isn’t spherical, but instead Iapetus has a triaxial ellipsoid shape. Its deviation from a sphere is obvious on some photographs. Iapetus also has a tall equatorial ridge of mountains, some of the highest mountains in the solar system (see fig. 11). The ridge, along with its odd shape, gives Iapetus the appearance of a walnut. Iapetus’s density is slightly larger than one, making it one of the least dense satellites in the solar system. This suggests that Iapetus is almost entirely ice with at most 20% rock. The surface of Iapetus is heavily cratered with no crater density segregation that is so common on other satellites. This suggests that most features of Iapetian surface date from Day Four with little modification since. Most striking about Iapetus is that its leading side is extremely dark (one of the darkest surfaces in the solar system) while its trailing side is very bright. 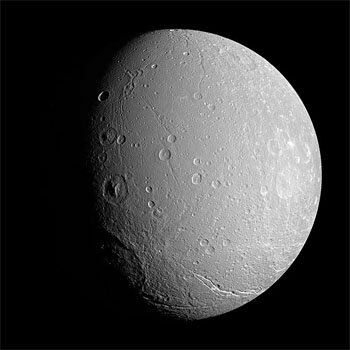 This is similar to Dione and opposite from Rhea, but Dione’s surface was considered the standard for those two bodies. However, Rhea and Dione are close to Saturn, and much of the matter striking their surfaces supposedly came from Saturn’s rings, and hence contained much bright-colored ice. Planetary scientists think that the Iapetian hemispherical albedo difference is explained by a two-stage process. Iapetus is the most distant satellite of any size orbiting Saturn. Its orbit is prograde, but many of the small satellites orbiting farther out are retrograde. Planetary scientists think that material eroded off those small satellites from micrometeoroid collisions and then slowing began spiraling in toward Saturn. 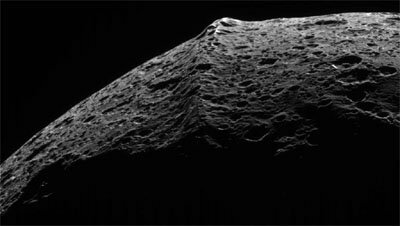 Along the way many particles, orbiting opposite to Iapetus, struck the Iapetian surface preferentially on the leading side. During the time intervening between those two events exposure to sunlight darkened the material. This is the first stage of the process. The second stage is the migration of ice from the leading to the trailing side of Iapetus. With its relatively slow rotation (79 days), the dark half of Iapetus gets hotter during the day and cooler during the night than the light half does. Being at a higher temperature, more ice sublimes from the darker half during its day, but most sublimed material will gradually re-condense randomly on the surface. Over time this positive feedback removed most of the exposed ice from the leading side of Iapetus. This scenario probably could work within the Day Four cratering hypothesis. Fig. 10. Cassini image of Iapetus, a satellite of Saturn. Fig. 11. Close-up showing a portion of the equatorial ridge on Iapetus. 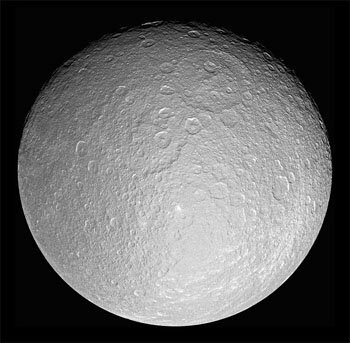 Mid-sized Tethys is the fifth largest satellite of Saturn. Its density is less than one, suggesting that Tethys is almost entirely ice. Furthermore, Tethys’s albedo is very high, consistent with a surface high in ice content. The entire surface of Tethys is heavily cratered (see fig. 12). A small part of the surface has smooth plain; they may be the result of modest cryovolcanism in the past. Ithaca Chasma is a graben running about three-quarters the way around Tethys. One theory of its origin is that it is impact related. With such little modification, the surface of Tethys likely dates from Day Four. Fig. 12. Cassini image of Tethys, a satellite of Saturn. Ithaca Chasma is visible from center toward lower left. Enceladus, Saturn’s sixth largest satellite, has the one of the highest albedos in the solar system. This is consistent with a surface made almost entirely of water ice. The surface of Enceladus is varied, ranging from heavily cratered terrain to sparsely cratered regions (see fig. 13). Many of its craters are degraded rather than modified. Its south polar region has few craters, but it has many tectonic features, such as fractures and ridges. 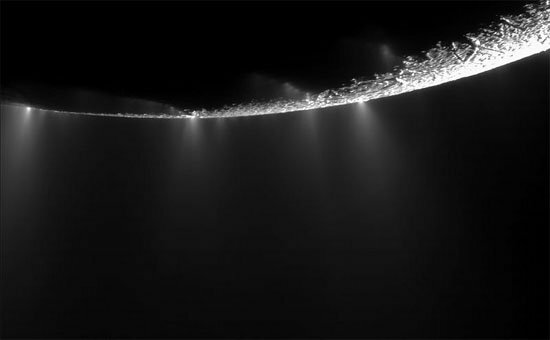 The Cassini probe revealed cryovolcanoes jetting water ice at the south pole of Enceladus (fig. 14), making it the third volcanically active satellite (the other two are Io and Triton, a moon of Neptune). Planetary scientists think that much of the degradation of craters and modification of the surface of Enceladus is due to its cryovolcanic activity. The Day Four cratering hypothesis would date most Enceladean craters as Day Four, but with reworking that has happened since and including current activity. Fig. 13. 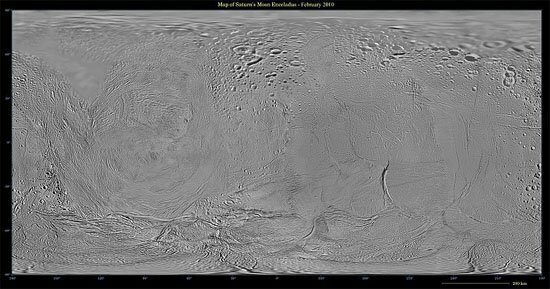 A map of the surface of Enceladus, a satellite of Saturn. Fig. 14. Geysers visible off the limb of Enceladus. 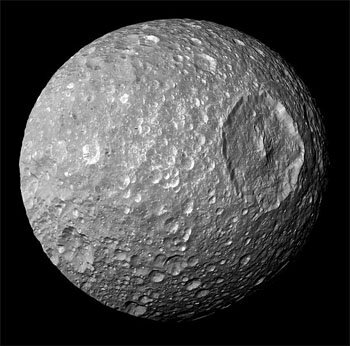 Mimas is Saturn’s seventh largest satellite, and it is the smallest astronomical body known with a round shape. Larger bodies are round because of self-gravity, so if a body is too small, it lacks the mass, and hence the gravity, to make itself round. Apparently, Mimas is just above the limit for this to work. The surface of Mimas is saturated with craters, indicating that it has undergone little, if any reworking (see fig. 15). 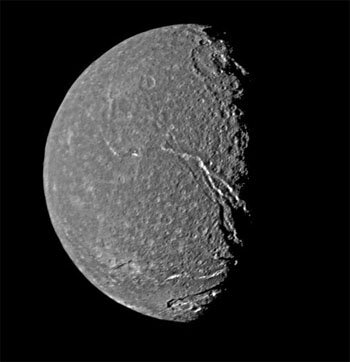 The most striking feature on the Mimantean surface is Herschel, a large impact crater named for William Herschel, the discoverer of Mimas. The diameter of Herschel is nearly one-third the diameter of the satellite. With its relatively weak gravity, it is a bit of a mystery how Mimas survived the impact required to form Herschel, for models of the impact required would cause the satellite to disrupt. On the other hand, in the Day Four cratering hypothesis, Herschel may have dated very late in the formation of Mimas. If so, then it would have been the result of a special, directed process, not the naturalistic process generally assumed. Fig. 15. Cassini image of Saturn’s satellite Mimas, showing the large crater Herschel. Titania and Oberon are the two largest satellites of Uranus, with Titania being slightly larger. Their densities, which are little higher than expected so far from the sun, suggest a composition of half ice and half rock. Oberon’s surface is nearly saturated with craters, suggesting little geological activity since its formation. Its surface has been modified by some canyons. Planetary scientists attribute the canyons to stress in the crust caused by contraction of near-surface layers as they cooled, accompanied by expansion of the interior as the water there froze. The Day Four cratering hypothesis would suggest that the cratering dated from formation. The canyons could be interpreted similarly to the secular view, either by late Day Four events or subsequent processes. While heavily cratered, the crater density of Titania (fig. 16) is less than Oberon’s. Titania also has more faults on its surface. These two facts could be difficult for the Day Four cratering hypothesis. One possibility is that the Day Four events on Titania not only included impacts, but faulting from cryovolcanic activity as well. However, we must be careful in interpreting the surfaces of the satellites of Uranus and Neptune, because typically we have photographed less than half of the surface of each. As with other satellites of the Jovian planets, earth-based studies have shown asymmetry in the color and spectral features. The leading hemisphere of Titania is redder than its trailing hemisphere, while the situation is reversed on Oberon. Water ice absorption bands are stronger on Titania’s leading side, the reverse of Oberon. These reversals are difficult to explain. Fig. 16. Voyager image of Titania, a satellite of Uranus. Umbriel and Ariel are the third and fourth largest satellites of Uranus. Umbriel is slightly larger, but Ariel has more mass, so Ariel’s density is slightly larger as well. Umbriel’s surface is the darkest and has the highest crater density of any of Uranus’s satellites. There is little evidence of any reworking, so Umbriel’s surface may be primordial. On the other hand, Ariel has the most reflective surface of the Uranian satellites. This high reflectivity probably is due to high ice content on the surface, something that is consistent with spectroscopic data. Ariel’s surface has a cratered region near the south pole. Elsewhere there is ridged terrain, and there are plains. The plains have few craters, suggesting much reworking, and the ridged areas appear to be the result of tectonic activity. Fig. 17 is an image of Ariel. Overall, the Day Four cratering hypothesis would suggest that the cratered regions date from Day Four, but that the remainder of the surface of Ariel probably is post Creation Week. Fig. 17. 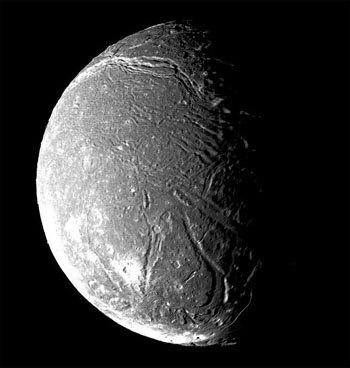 Voyager image of Ariel, a satellite of Uranus. Miranda is the fifth largest satellite of Uranus, and it orbits closer to Uranus than any other moon of any size. While Miranda’s surface has craters, its surface has been considerably reworked with many intersecting canyons. It appears to be the most geologically active satellite of Uranus. This is surprising, given its small size, because small bodies generally have insufficient heat for volcanism. The most common explanation is that Miranda recently was in a 3:1 tidal resonance with Umbriel. This resonance allegedly caused changes in its orbital eccentricity, which caused tidal flexing. I would view the surface as being modified since the Creation Week. Neptune has only one satellite of any size, Triton. Triton is the only major satellite that orbits retrograde. Furthermore, it has a large inclination both to the orbital and equatorial planes of Neptune. 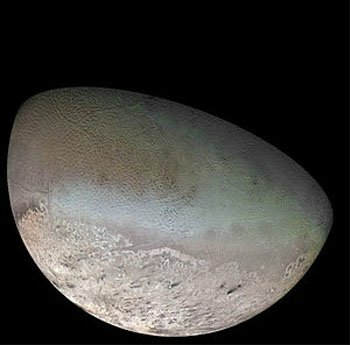 This has caused astronomers to hypothesize that Triton was captured by Neptune’s gravity. There is at least one problem with this suggestion—Triton’s orbit is very circular, but a capture event ought to result in a highly elliptical orbit. Tidal interaction can circularize an orbit, but it doesn’t appear that there has been enough time for this to have happened. The density of Triton closely matches that of Pluto, and, given the close proximity of Pluto and other Trans Neptunian Objects (TNOs), many astronomers assume that Triton came from the asteroid belt that exists beyond Neptune’s orbit.5 However, Triton is larger than any of those objects (the two largest being the dwarf planets Eris and Pluto. Triton is home of the famous “cantaloupe” surface (fig. 18). This unusual feature, along with few craters, is attributed to recent geological activity. Indeed, Voyager 2 photographed the eruption of several cryovolcanoes during its flyby in 1989. As previously mentioned, Triton is just one of three geologically active satellites known in the solar system. However, rather than the molten material being water, it is more likely nitrogen and to a lesser extent, methane. Of course, the Day Four cratering hypothesis would suggest that most Day Four craters are now obliterated. Fig. 18. Voyager image of Neptune’s satellite Triton, showing its cantaloupe surface. I have applied the Day Four cratering hypothesis to all the solid surfaces of the solar system for which we have photographs of sufficient resolution. More specifically, I have surveyed the other three terrestrial planets, the four Galilean satellites of Jupiter, the seven largest satellites of Saturn, the five largest satellites of Uranus, and Triton, the largest satellites of Neptune. The surfaces of these bodies show a wide range in characteristics, from heavily cratered to heavily modified. The remaining bodies for which we have sufficient photographs, the smaller, non-spherical asteroids and satellites, are saturated with craters. With the Day Four cratering hypothesis I suggest that the heavily cratered surfaces are primordial, dating from the assembly of these bodies on Day Four with little activity since. The less cratered and/or modified surfaces have undergone reworking since the Creation Week. In the cases of Io, Enceladus, and Triton, the reworking clearly goes on today, for we have observed volcanic or cryovolcanic activity on these bodies. It may be that a few bodies are still undergoing some geological activity, but they may not have been active when we closely observed them with spacecraft. On some bodies, the mixing of modified features and fresh craters suggest that some reworking occurred during Day Four creation. Within the recent creation framework the rates of modification in the past must have been very high. These inferred high rates of geological activity may qualify as catastrophic, but it is not necessary that any of these be identified with any particular biblical catastrophe. The Day Four cratering hypothesis can explain the overall features of the surfaces of solar system bodies. Of course, this is only a brief discussion dealing with the large-scale picture of each body. In such a brief survey, many questions cannot be addressed. An important question that I have not addressed is why the earth and moon share a common crater size-frequency distribution with Mercury and Mars, if the LHB was restricted to the earth and moon. Another question is whether differentiated bodies in the solar system were created that way or if they went through a post-creation process to become differentiated. These are questions worthy of further discussion. Each body has varied topography worthy of more detailed study. I hope to further develop details to strengthen the hypothesis. I would be most interested in inclusion of RATE in the development of the Day Four cratering hypothesis. I encourage discussion, and I encourage those with different views on when craters occurred to develop their ideas further. Anderson, L. 2013. Thoughts on the goodness of Creation: In what sense was Creation “perfect”? Answers Research Journal 6:391–397. Retrieved from http://www. answersingenesis.org/articles/arj/v6/n1/goodness-of-creation. Faulkner, D. 1999. A biblically-based cratering theory. Creation Ex Nihilo Technical Journal 13, no. 1:100–104. Faulkner, D. 2000. Response to Faulkner’s ‘biblically-based cratering theory’ Reply by Faulkner. Creation Ex Nihilo Technical Journal 14, no. 1:47–49. Faulkner, D. R. 2013. The second law of thermodynamics and the curse. Answers Research Journal 6:399–401. Retrieved from http://www.answersingenesis.org/articles/arj/v6/n1/thermodynamics-and-curse. French B. M. 1998 Traces of catastrophe: A handbook of shock-metamorphic effects in terrestrial meteorite impact structures, pp. 79–96. Houston, Texas: LPI Contribution No. 954, Lunar and Planetary Institute. Henry, J. 2003. Using care in defining evolution as mere change in astronomy and biology. Creation Research Society Quarterly 40, no. 2:124–127. Henry, J. 2010. Solar system formation by accretion has no observational support. Journal of Creation 24, no. 2:87–94. Hill, R. 2001. Did entropy change before the curse? Creation Matters 6, no. 5:6–7. Hill, R. 2008. The tectonics of Venus and Creation. In Proceedings of the Sixth International Conference on Creationism, ed. A. A. Snelling, pp. 205–212. Pittsburgh, Pennsylvania: Creation Science Fellowship and Dallas, Texas: Institute for Creation Research. Newton, R. 2002. The short-period comets ‘problem’ (for evolutionists): Have recent ‘Kuiper Belt’ discoveries solved the evolutionary/long-age dilemma? TJ 16, no. 2:15–16. Oard, M. J. 2005. Kuiper Belt woes for accretion disk models. TJ 19, no. 2:10–11. Oard, M. J. 2009. How many impact craters should there be on earth? Journal of Creation 23, no. 3:61–69. Oard, M. J. 2012. An impact Flood submodel—Dealing with issues. Journal of Creation 26, no. 2:73–81. Oard, M. J. 2013. What do impacts accomplish in the first hour? 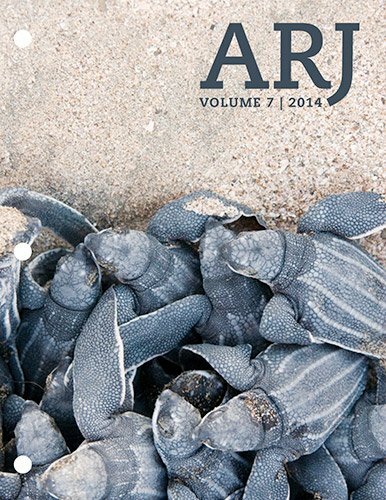 Journal of Creation 27, no. 1:90–98. Samec, R. G. 2008a. On the origin of the lunar maria. Journal of Creation 22, no. 3:101–108. Samec, R. G. 2008b. Is the moon’s orbit “ringing” from an asteroid collision event which triggered the Flood? In Proceedings of the Sixth International Conference on Creationism, ed. A. A. Snelling, pp. 255–261. Pittsburgh, Pennsylvania: Creation Science Fellowship and Dallas, Texas: Institute for Creation Research. Samec, R. G. 2013. The Mars desert hypothesis and the Marsrate connection. In Proceedings of the Seventh International Conference on Creationism, ed. M. Horstemeyer. Pittsburgh, Pennsylvania: Creation Science Fellowship. Spencer, W. R. 1994. The origin and history of the solar system. In Proceedings of the Third International Conference on Creationism, ed. R. E. Walsh, pp. 513–523. Pittsburgh, Pennsylvania: Creation Science Fellowship. Spencer, W. R. 1998. Catastrophic impact bombardment surrounding the Genesis Flood. In Proceedings of the Fourth International Conference on Creationism, ed. R. E. Walsh, pp. 553–566. Pittsburgh, Pennsylvania: Creation Science Fellowship. Spencer, W. R. 1999. Earth impacts, the geological column, and Chicxulub. Creation Research Society Quarterly 36, no. 3:163–165. Spencer, W. R. 2003. Tidal dissipation and the age of Io. In Proceedings of the Fifth International Conference on Creationism, ed. R. L. Ivey, Jr., pp. 585–595. Pittsburgh, Pennsylvania: Creation Science Fellowship. Spencer, W. R. 2008. Our solar system: Balancing biblical and scientific onsiderations. In Proceedings of the Sixth International Conference on Creationism, ed. A. A. Snelling, pp. 293–306. Pittsburgh, Pennsylvania: Creation Science Fellowship and Dallas, Texas: Institute for Creation Research. Spencer, W. R. 2013. Impacts and Noah’s Flood—How many and other issues. Journal of Creation 27, no. 1:85–89. Williams, E. L. 1966. Entropy and the solid state. Creation Research Society Quarterly 3, no. 3:18–24. Worraker, B. 2004. Missing: A source of short-period comets. TJ 18, no. 2:121–127. Previous Paper An Initial Estimate toward Identifying and Numbering the Ark Turtle and Crocodile Kinds Next Paper Did the Moon Appear as Blood on the Night of the Crucifixion? A few bodies, such as Jupiter’s satellite Europa, have sparse craters. During a panel discussion on cratering at the Seventh International Conference on Creationism (2013), John Baumgardner raised the issue of radiometric dates giving relative dates within the RATE paradigm. Such an approach may not give the same relative date for lunar maria and the Flood. Austin said this during a panel discussion on cratering at the Seventh International Conference on Creationism (2013). Many astronomers think that TNOs are in the hypothetical Kuiper belt, the source of short period comets. However, there are reasons to question the equating of TNOs with the Kuiper belt. See Newton (2002), Oard (2005), and Worraker (2004).